A lot of my bromeliads swing from on high now. I bet you know where this is going. When have I ever left well enough alone, or been a one-bromeliad-per-sphere person, so to speak? By April 2014 there were two. By June of 2015, there was lots of company. It’s actually been thinned out a little since 2015. 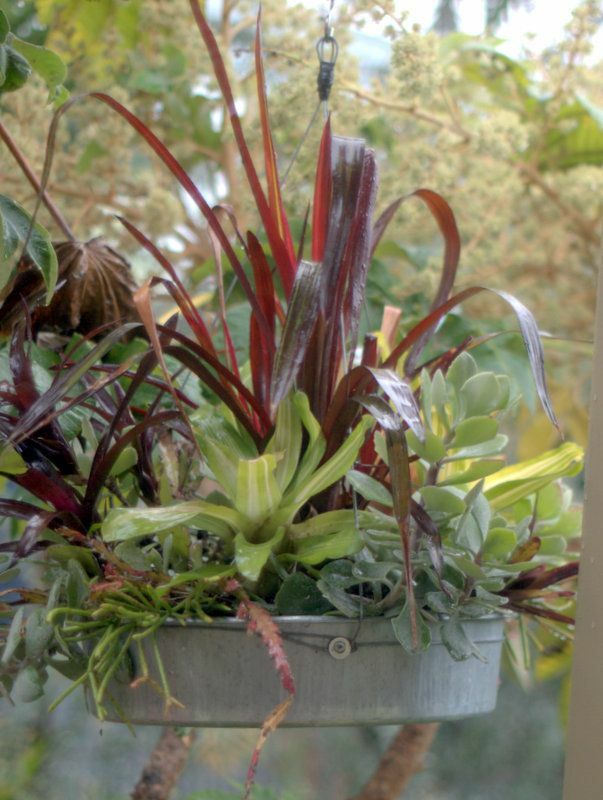 Some of the bromeliads grow too large and get moved out into pots. 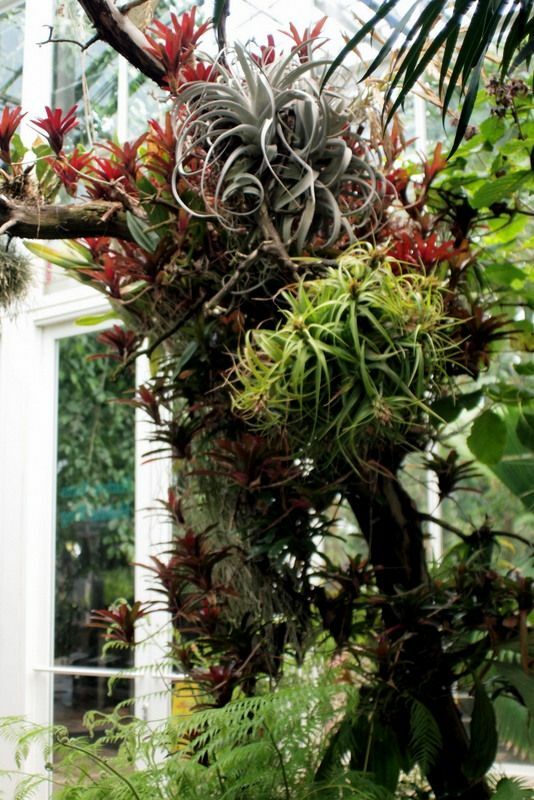 There are terrestrial, ground-dwelling bromeliads, which can get enormous like the alcantareas, and epiphytic, tree-dwelling bromeliads. 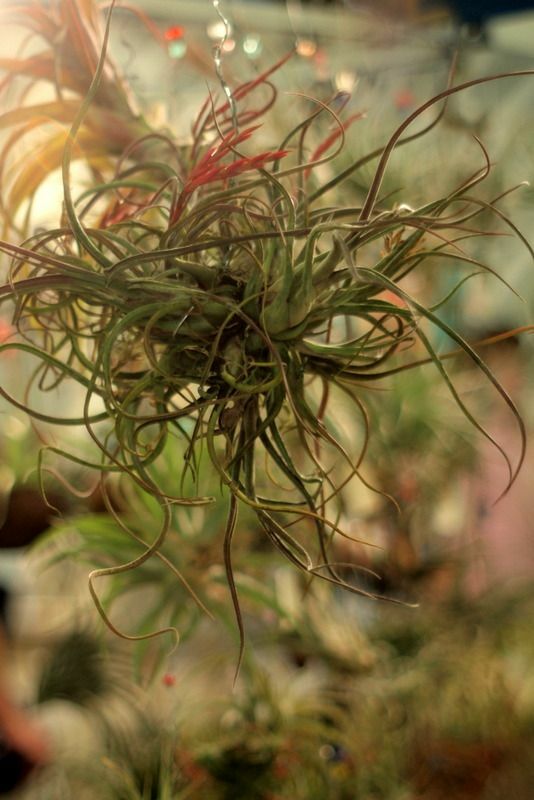 Although I didn’t know it at the time, that first aechmea was a good choice, being an epiphytic bromeliad, with roots adapted to clinging to trees. Now you know as much as I do about these plants with the fabulously plasticine, kaleidoscopic leaves and flowers as colorful as tropical birds. 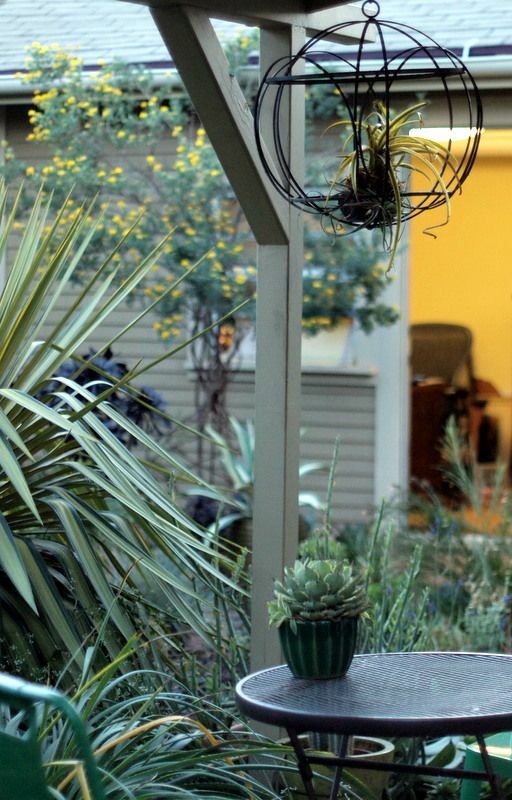 Like succulents, these are forgiving plants that don’t punish ignorance. A more organic approach than my sphere is an option, as seen in this example in the cloud forest section of the Huntington Botanical Garden’s conservatory. 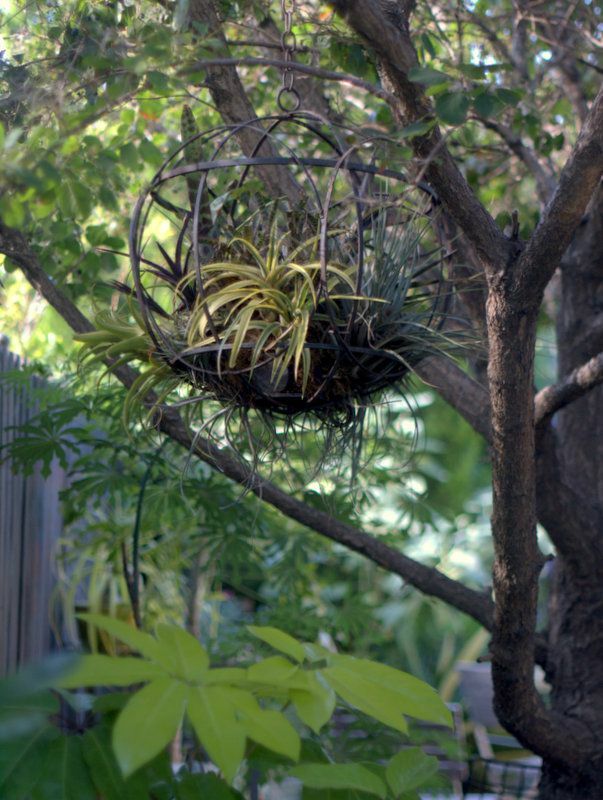 Bromeliads are mossed and fixed to the branch by florist wire or fishing line (further instructions here). There are thousands of species of bromeliads, pretty much all of them native to Central and South America (the neotropic ecozone.) Some of the more familiar are the ones we make upside-down cakes with (pineapples) and the wildly popular air plants/tillandsias. 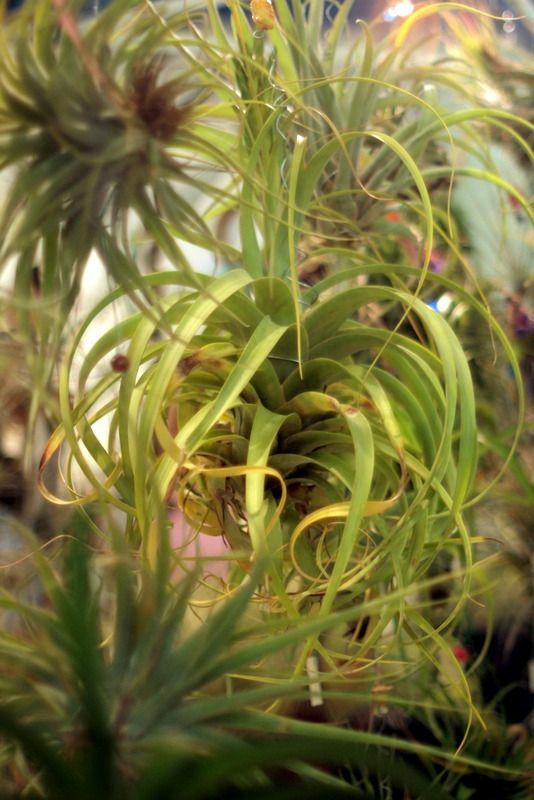 Some enthrallingly kinetic examples of tillandsias from local nurseries and plant shows. 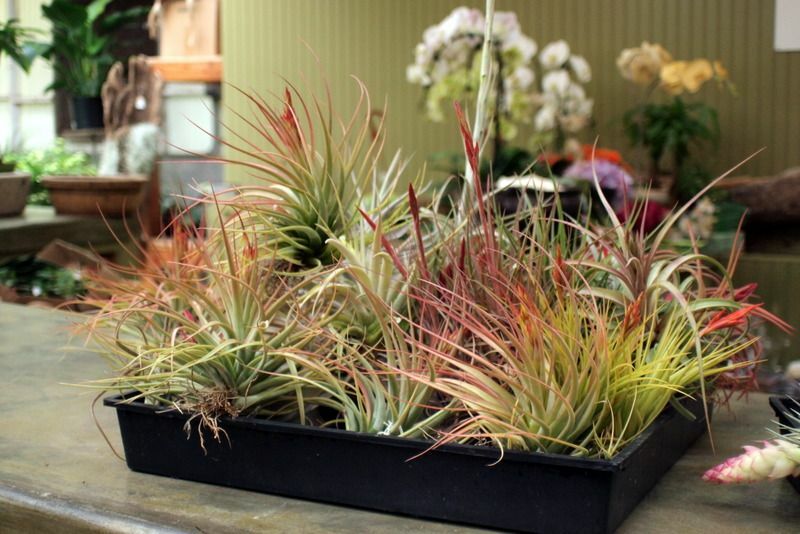 Rest assured, there are great minds out there applying themselves to devising methods for displaying tillandsias. 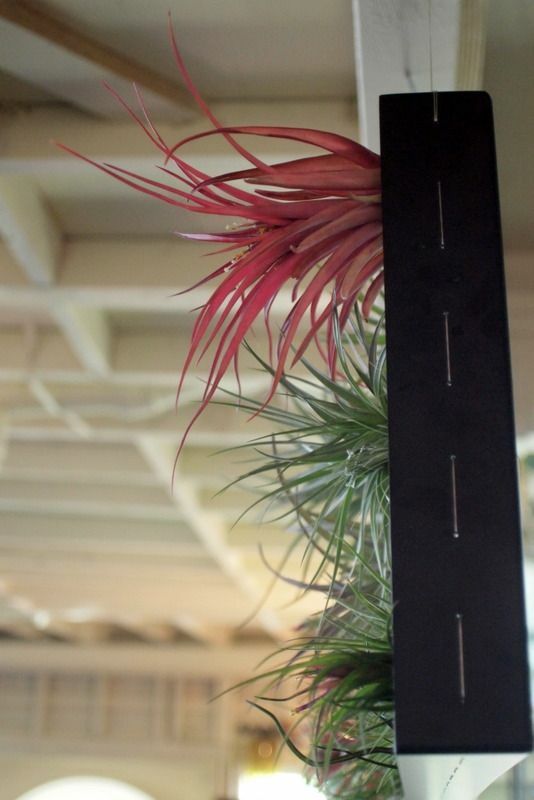 Above is the Airplantman Josh Rosen’s Airplant Frame seen at Big Red Sun in Venice. Seth Boor in collaboration with Flora Grubb designed the Thigmotrope Satellite. Another hanging arrangement with tillandsias from my garden. I incorporated most of these into the sphere. The takeaway here is, this growing arrangement has legs. The plants thrive on very little input from me. For truth be told, for all my enthusiasm, I am not the most technically gifted plant caretaker. Requiring little soil, mostly just moss, tolerant of dryish conditions, appreciating a refreshing spritz with the hose once a week. And that’s it. 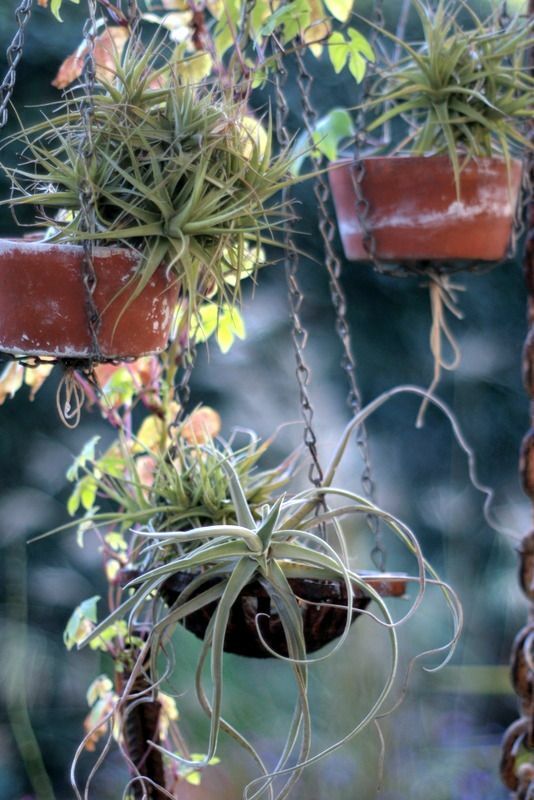 In fact, the care for shade-tolerant succulents and bromeliads is so similar that I combine them in shallow planters. As rain forest understory plants that can absorb nutrients and moisture through their leaves, I’ve always assumed, for Los Angeles, shade is the safest best. 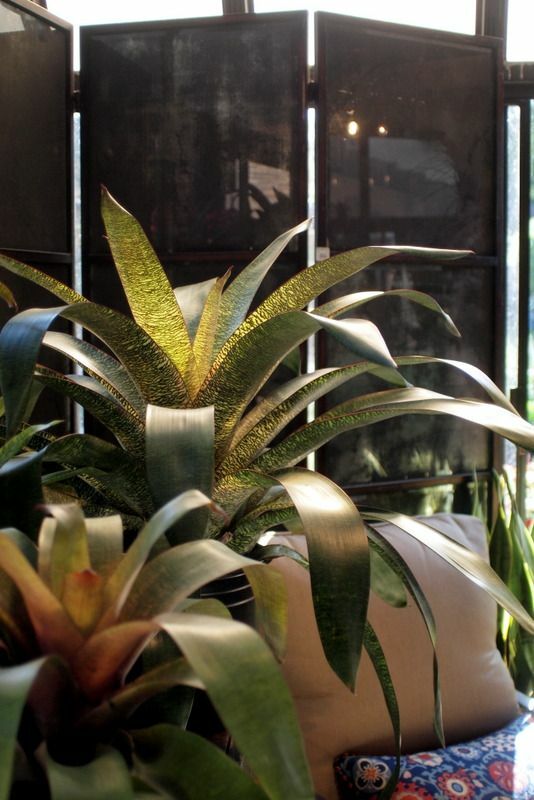 But some bromeliads can tolerate a surprising amount of sunlight, as long as it’s not strong afternoon sunshine. I’m trying out a few under an acacia tree with grasses. The best leaf color is obtained by exposure to as much sun as can be tolerated without leaf burn. There are surer ways of sorting out light requirements for the different species, of course, like consulting a reference book. “Bromeliads for the Contemporary Garden,” which I haven’t read, looks promising. Nice-sized specimens, however, do not come cheap. I like looking for deals on small pups at bromeliad shows, like the upcoming show August 6th & 7th at Rain Forest Flora in Torrance. You don’t happen to have a sphere lying around? What the heck, it’s mid summer. Go ahead and treat yourself. Salvage yards are full of interesting possibilities. 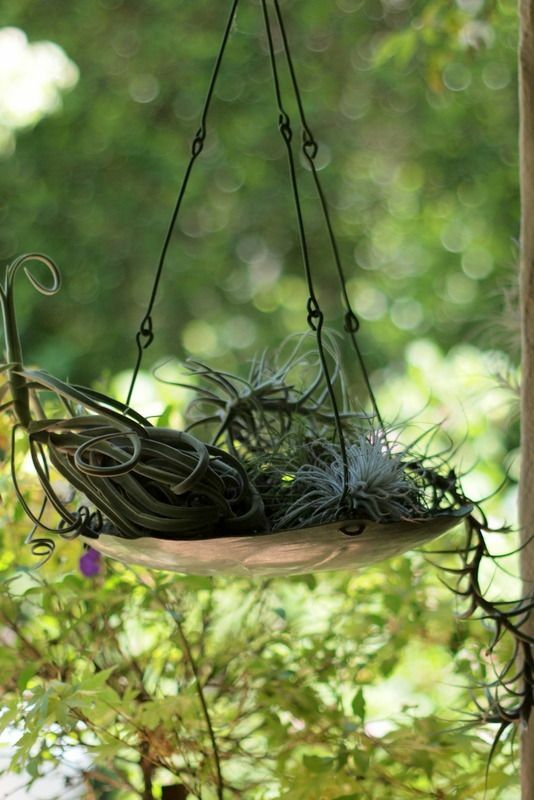 And Terrain offers a very similar Hanging Planter here. Potted’s Hedge Hanging Planter would work just as well. Or get to work with a branch and some fishing line. I’ve got an empty hayrack that I’d love to see overflowing with bromeliads. More images of bromeliads from AGO can be found here. 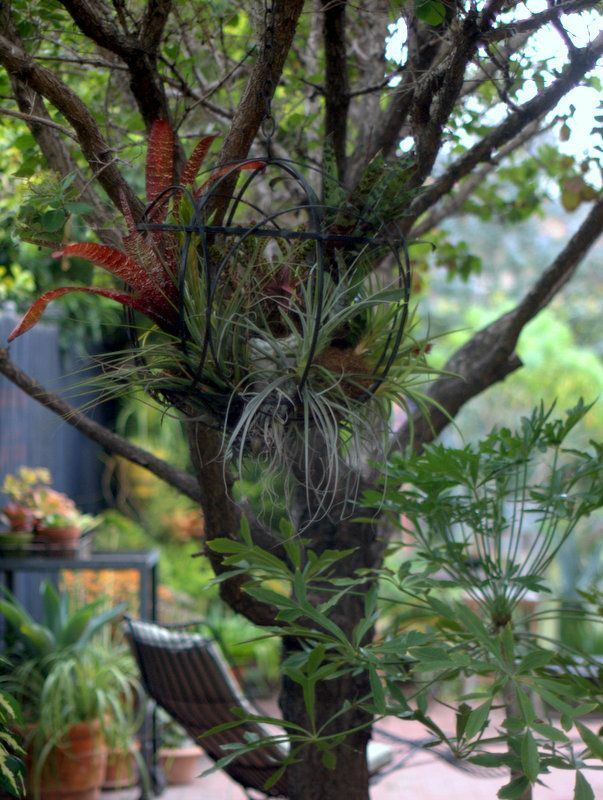 This entry was posted in commerce, design, garden ornament, pots and containers and tagged Aechmea recurvata 'Aztec Gold', Big Red Sun, bromeliads, Bromeliads for the Contemporary Garden by Andrew Steens, Coronilla valentina subsp. 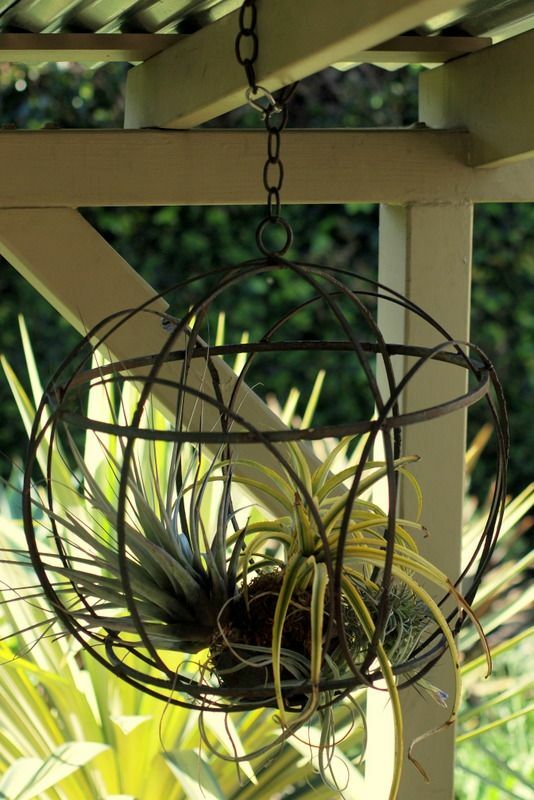 glauca, hanging plants, Josh Rosen Airplant Frame, Potted's Hedge Hanging Planter, Rain Forest Flora, Seth Boor/Flora Grubb Gardens, Terrain's Sphere Hanging Basket, Thigmotrope Satellite, Venice Calif., Yucca 'Margaritaville'. Bookmark the permalink. Such a great post. Your sphere is amazing in every incarnation: from empty to stuffed. Love it. Your large Vrisea is a great specimen. I first saw a similar Vrisea in the conservatory in Golden Gate Park and fell in love. Most of the few bromeliads I have here in Ohio summer out of doors, but now I’m finding that they are high maintenance because they are lovely mosquito breeding pools. Is it too dry in LA for mosquitos? Tim, we do have to watch out for mosquitoes and standing water so need to make sure to flush the tank broms out. I’ve never had mosquito issues at home but don’t have very large specimens either. That large vriesea you admire isn’t mine — I wish! — but a local nursery’s. Why did I think most of these like humidity? I know mine struggle in the dry indoor winter air. Alan, that’s a topic for another blogger! I don’t bring them inside for winter here in zone 10, but we are subject to some ferocious dryness with the Santa Anas, etc. I love these plants but the prices usually make me choke. Nonetheless, I may have to make a trip to Rain Forest to check out what they have to offer. I used to live near there but only rarely get there now. Thanks for the heads up about the show and sale. @Loree, the last one was taken on a garden tour. I came across the photo when searching for info on this post and loved the way the hanger was put together. Nice birthday gift — Lotusland! Great post! I just love all the broms. Excellent post and gorgeous photos. I think they like humidity. I’m still trying to figure out how to deal with that. They look great in your sphere Denise, and I like using them up here in the Bay Area in hanging baskets too. 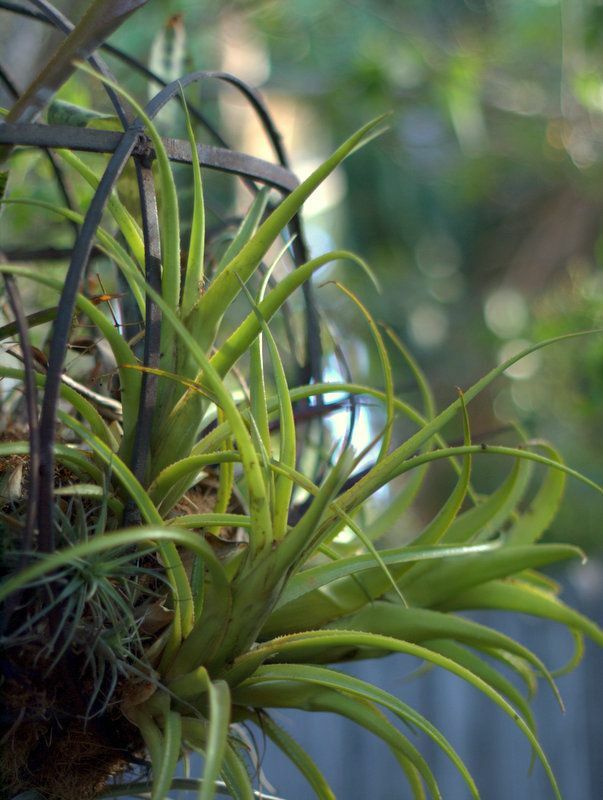 I usually tuck them into Moss lined baskets with Cactus mix type soil mix, combined with other epiphytes like Rhipsalis and succulents and then tuck non-soil needing Tillandsias amongst the planted Aechmeas, Neoregelias, Billbergias etc. I can use them in full sun here in Berkeley with our cooler summers and fog, although dappled shade or morning sun is safer in a heat wave. 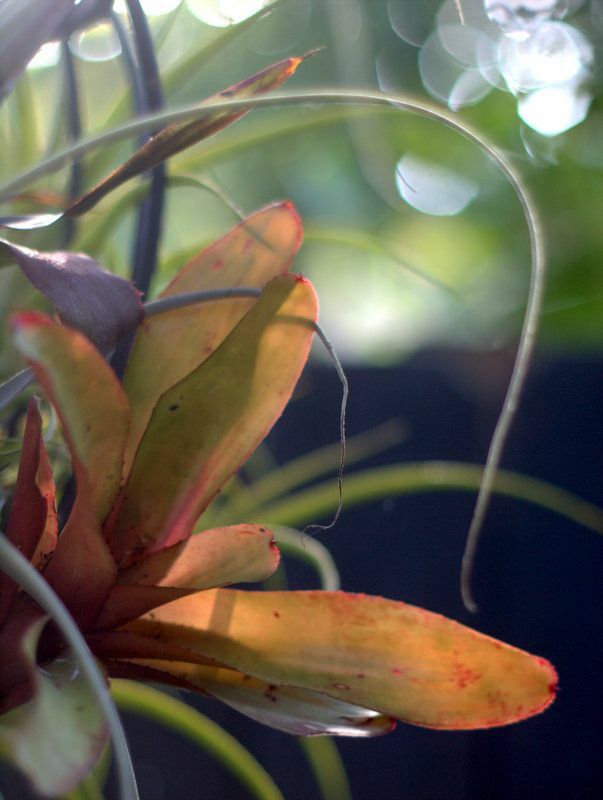 Most bromeliads do appreciate either constant water retained within their tank foliage, or a wet down via spray or water dunk a couple times a week. Using a spray bottle to mist foliage when grown indoors really helps them stay happy. For those who prefer the dryer look, the terrestrial taxons such as Dyckias, Hechtias, Puyas and some of the Aechmeas can be used similarly to cacti and succulents in full hot sun. I think baskets would lend themselves better to the larger tank type bromeliads, as the foliage would get crimped by your sphere. 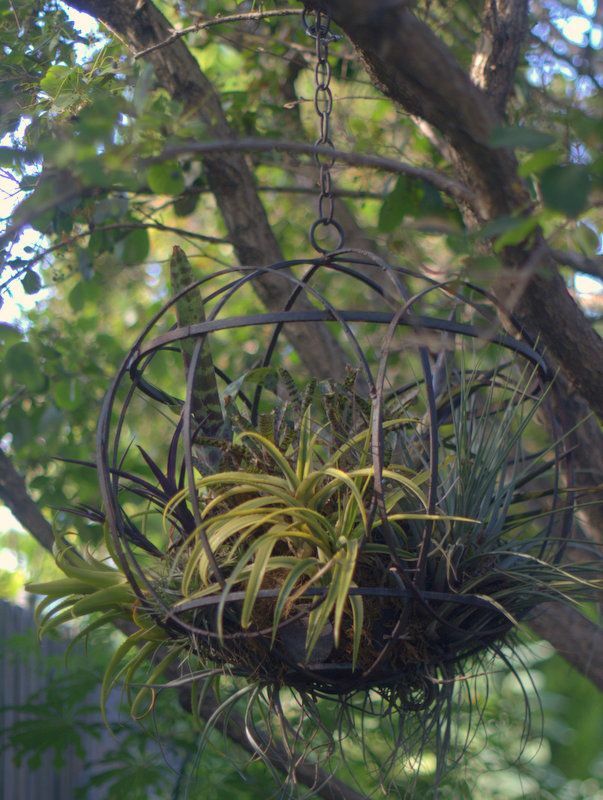 The larger Vrieseas and Alcantareas get too large for most hanging baskets, but smaller Vrieseas can work well. One technique I like for retaining moisture in the soil mix is to add a buried cottage cheese/yogurt containers filled with pebbles to hold water. 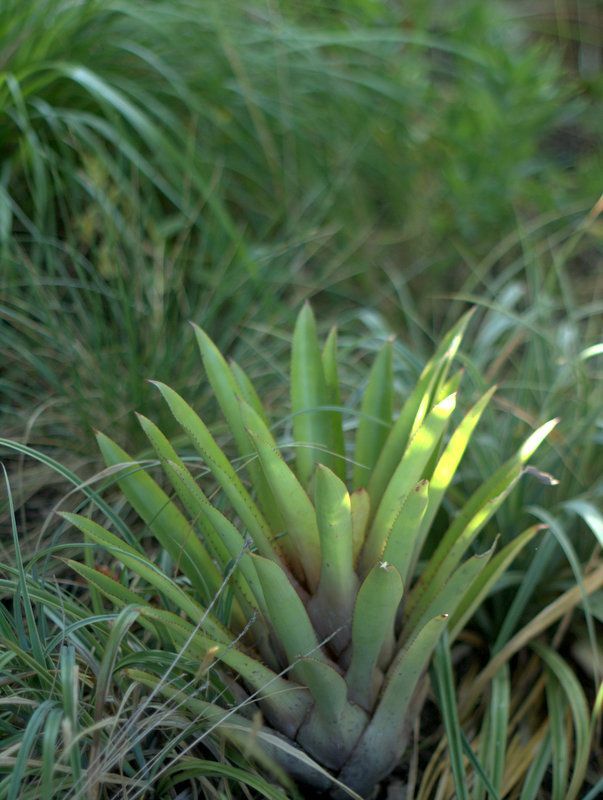 Most bromeliads love this reservoir of retained moisture, and fill it with roots. My collection of bromeliads has run amuck, I need to start doing some sidewalk sales again to pare it down again to more manageable levels. I do love them for the ease of care and good color foliage effects all year round. Flowers are simply a seasonal bonus. @Deanne, you’ve mossed and planted branches, right? I know you’ve hear the siren call of the bromeliad! @Hoov, obviously I’m no expert, but mine seem to thrive in the ambient humidity among other plants. I don’t think we necessarily have to be in Florida. @David, yes, that’s what happened with the larger broms, their leaves became crimped. The yogurt container is a great idea — I’ve got lots of those! Thanks so much for your hard-earned wisdom — and if you do ever have that sale be sure to let me know! One of my favorite groups of plants and you’ve used them extremely well in your sphere. Thanks for passing on the inspiration! I have a hanging moss ball/Kokedama that had thyme planted in it last year that died for lack of water. I wonder if I could replace it with a Bromeliad (and take better care of it)? 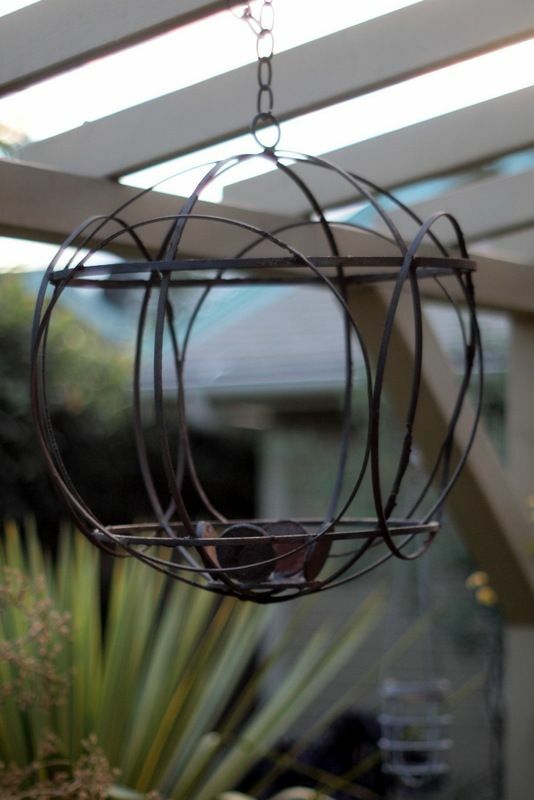 I just might put a few into the hanging bird cages I have on my front porch too, if I can find ones that don’t mind some sun. Your pictures are all very inspiring. I’ve been planning for a couple of years to put together a large piece of driftwood with a bunch of Broms hanging on it. Annies Annuals has Cousin Itt!